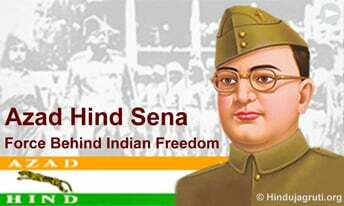 July 5 : HJS salutes Azad Hind Fauj on its 'Foundation Day' ! July 5: Salutes to brave and fearless soldiers of Azad Hind Fauj on its 'Foundation Day' ! Azad Hind Sena's soldiers due to negligence by Congress ! Thousands of brave men and women rose to Netaji Subhashchandra Bose's call to take up arms against the British and joined the Azad Hind Sena. They gave up everything they had, all their comforts, their families so that they could fight against the British forces and get India her freedom. But the very same soldiers and their descendents live in pitiable penury, as refugees in Myanmar (formerly Burma). Close to 4 lakh people of Indian origin have been denied citizenship there. Neither are they allowed to obtain jobs, nor buy or sell land! They cannot even travel freely within Myanmar! They always have to carry a 'registered foreigner permit' on them and even shell out money to have it renewed each year. These people sacrificed everything to ensure that we live in a free India, does the Government of India have no obligation to them? How do you pronounce letter Z (Zee) ? July 1 : Rajmata Jijabai (Mother of Shivaji Maharaj) Smrutidin !